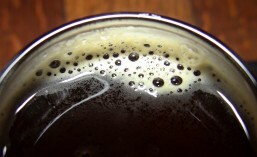 Black Raven Brewing Company (CBM Sponsor) uses the tag line, “Ales of great distinction and character”. I would have to agree with that assessment. Black Raven does indeed brew several different, delicious and very distinct beers. From their ever popular Wisdom Seeker Double IPA to other sought after beers like Trickster IPA, Great Grandfather Raven Imperial Stout, La Mort Bourbon, Gunpowder Plot Nitro Porter, Splinters Bourbon Barrel Scotch Ale and every other beer in-between, you know when you’re drinking a Black Raven beer. Now Black Raven is ready to add yet another beer to their extensive and impressive lineup. Coming this Friday, January 19th, Black Raven will be releasing Updraft American Style Pale Ale. It’s harvest time up in the Yakima Valley, the #1 hop growing region in the World. Our proximity to the hop fields of Yakima Valley means that the Northwest, particularly Washington State, is in a prime location to enjoy one of the best benefits for craft beer lovers this time of year: Fresh Hop Ales. As has become the norm, Two Beers Brewing Company (CBM Sponsor) was first out of the gate, releasing their Fresh Hop IPA back on August 23rd. Now, Fremont Brewing Company is ready to release the first of their Fresh Hop Ales for 2017. Field To Ferment Fresh Hop Pale Ale (each release featuring Centennial, Amarillo and Citra hops respectively) arrives today, 9/6, in Fremont’s Urban Beer Garden.